This Condo Villa is located in Dominicalito, uniquely located on a lush terraced hillside with a breathtaking 180 degree white water view where you can watch the surf all day and listen to it all night. Located inside the gated community of Canto del Mar (Song of the Sea) which many regard as the “best location in town.” It is a 3-minute walk to Playa Dominicalito and minutes from shopping, restaurants, and tourist attractions. It has been owned by a single owner, never used as a vacation rental, and lovingly maintained. The 1300-sq foot two-story turnkey villa is fully furnished, with mostly custom hand-crafted furniture and decor, and has two-bedrooms, two and one-half baths. The top floor has a spacious and bright living space with a kitchen, lounge area, and dining room. Over sized sliding glass doors flow into a large balcony and fully covered terrace, perfect for outdoor entertaining and wildlife viewing – with frequent sightings of toucans, sloths, a variety of birds, and monkeys. The Palmex covered palapa (guaranteed for 25 years) was extended from the original design to fully cover the terrace and carport. This is a perfect choice for anyone looking for a home to live in full time or as an income producing property. 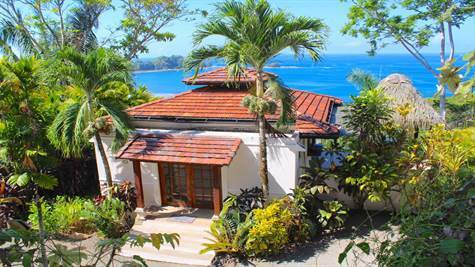 This home is currently being used as a private residence, but with an increase in demand for affordable, high-quality, easily accessible ocean view homes in the area, It could be an excellent rental potential. To assist with villa management, the community is staffed with 24-hour security, landscaping service, and onsite property management services.